We all know that the economy has found many people in a tight bind. People are doing what they can to make ends meet. One of the things people are doing are having yard sales. I have noticed around our neighborhood the number of yard sales signs has increased dramatically in the last year or so. I have also noticed that people are having yard sales not just on Saturdays anymore. 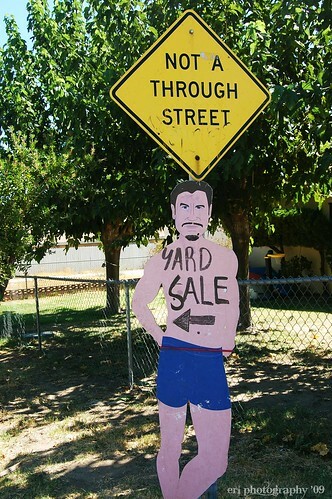 When each telephone pole and street corner are covered in cardboard, or bright poster paper signs you really need to get creative to make sure your yard sale sign stands out from the rest. I wonder if he's for sale.